Although slated to close on October 5 to be reconfigured into a Frozen ride, Maelstrom in Epcot’s Norway pavilion still has secrets to tell. It combines numerous historical details with national points of pride, although many visitors may not be aware of the references. The storytelling begins in the queue, where an illustrated map graces an entire wall and includes several archaeological spots on the globe of relevance to Vikings and Norwegian history. Perhaps the most visible among those are the Oseberg Viking ship (later seen in the post-show movie) and related Oseberg wagon (seen in the village sequence of the ride itself). The Oseberg ship also provided the inspiration for a climb-aboard playground ship along the side of the Norway pavilion, though this was removed several years ago, and now only fragments of this ship remain, and have been repurposed for the Agent P interactive game. But there are other significant historical sites on that wall map. The Fram, a fabled Norwegian ship locked in Arctic ice for three years in the 1890s in an attempt to reach the North Pole, is shown near the top of the wall map. At this point, visitors should look across the queue room to the colorful mural painting on the opposite wall. In addition to trolls, cruise ships, and quaint villages, the painted mural also includes a representation of the Fram stuck in the ice, even bearing the ship’s correct name on the side. The tall sailing ship on the mural similarly bears a real name: Christian Radich. This windjammer was made famous in the 1950s and has set speed records, and is still in use today. But the best example that really shows how much effort Disney Imagineers put in for the sake of authenticity can be found on the far end of the mural. The three oil platforms depicted here are true-color representations of a trio of real oil platforms in Norway. Even more impressive, the largest platform here on the mural carries a label: Gullfaks A, Block 34/10 – the real names and details about these platforms. Digging into the history a little bit, we learn that the three Gullfaks platforms opened in the 1980s, with the last one opening just after the Norway pavilion debuted at Epcot, so the new ride was showcasing “up to the minute” technological wonders from their country. Now it makes sense why we see three oil platforms in the climax of the ride as well. They were Norway’s pride. Of course, it wouldn’t be Disney without leaving at least one Hidden Mickey around for us to find. It’s located on the Viking ship on the mural, where one intrepid warrior is sporting a rather familiar set of mouse ears! After working for 15 years at Disneyland, Kevin moved to the East Coast, where he has been a weekly visitor of Walt Disney World since 2004. Kevin is the author of Walt Disney World Hidden History (second edition). This softcover book tracks Disney “hidden history” — remnants of former attractions and tributes to Imagineers as well as other Disney officials — hiding in plain sight in the parks. The second edition of the book has now been released with 164 new entries, almost doubling the amount of remnants and tributes discussed. Whether tribute or remnant, each item discussed starts with something visible in today’s parks; the idea is that this is something you could visit and see with your own eyes, and then appreciate the historical thinking behind it. For the first time, this edition now includes a photo of every item discussed so you’ll know what to look for. 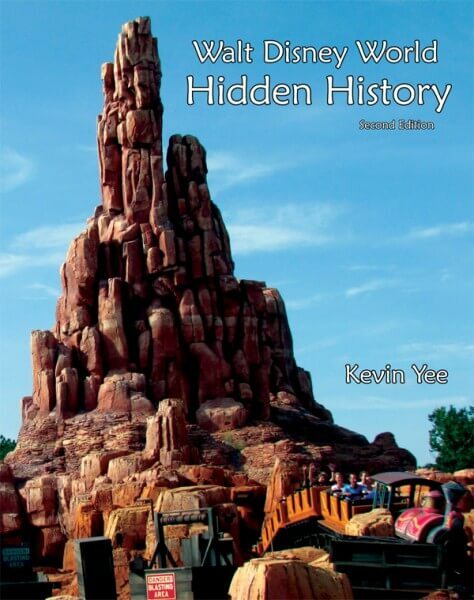 Kevin Yee’s book Walt Disney World Hidden History (second edition, 2014) tracks Disney “hidden history” — remnants of former attractions and tributes to Imagineers as well as other Disney officials — hiding in plain sight in the parks. There are over 300 entries in the book! Whether tribute or remnant, each item discussed starts with something visible in today’s parks; the idea is that this is something you could visit and see with your own eyes, and then appreciate the historical thinking behind it. Kevin is also the author of the annual book The Unofficial Walt Disney World ‘Earbook, which each year tracks all the additions and removals from the WDW parks, providing full-color photo-rich retrospectives of everything. See http://bit.ly/kevinyee for more information. I still think this is a bad idea. Could not agree with frostysnowman more. I can appreciate putting character meets in countries, but taking out a historic and cultural attraction and replacing it with a cartoon based attraction just seems to be against the spirit of Norway. I fear it is a slippery slope into losing what makes Epcot special in an attempt to cannibalize on the money little girls get their parents to spend on Frozen. They should have replaced Stitch’s Great Escape with the new Frozen ride and left Maelstrom alone!! We loved that attraction! People are still crying about this ride? People this was one of the cheapest attractions at Epcot back in the 80’s. 90% of Epcot’s best attractions were removed/destroyed ages ago, you people just getting upset now really need to look back and realize your complaints are too little and waaaaaaaaayyyyyyyyyy too late. If we had Anna & Elsa narrating the history of Norway, I could see the changes. Excellent as always from Kevin Yee. I am really digging his columns here on Inside the Magic. Reading a Kevin Yee article is like listening to a world expert speak on a favorite subject. He is just so knowledgeable. I wish someone would make a documentary of him narrating a trip through all the parks. It would win the Oscar for best documentary on Disney ever I bet.